In the last two articles, I talked extensively about the different types, and different preparations of protein that can be found in infant formula. In this article, let’s hit the other two macronutrients: Carbohydrates and Fat. Then I’ll leave you with some explanation of the micronutrients (vitamins and minerals) found in formula. The predominant carbohydrate source in human milk is lactose. All infants are born with the ability to digest lactose. This is often a source of confusion for parents when infants/children develop an allergy or intolerance to cow’s milk. Many people naturally assume it is the lactose in the milk because lactose makes a lot of parents gassy, crampy, and cranky too. However, when an infant develops a reaction to something in cow’s milk it is almost always a component of the protein, not the lactose (see the article above that explains why hydrolyzed protein formulas can prevent allergy development). In short, lactose is not a bad thing, it’s what infants are supposed to eat. 2) Lactose is fundamentally different from these other sugars. Lactose is a glucose and a galactose molecule joined together. All babies make an enzyme called lactase that breaks these molecules apart so they can be absorbed. Corn maltodextrin is primarily all glucose molecules. This means corn sugar will not utilize infants’ lactase enzyme that is ready-to-go. Furthermore, it is possible that corn sugar may have a larger impact on infant blood sugar as it contains more glucose per gram than lactose does. 3) Almost all of the corn in this country is now genetically modified. While I do not take a firm stance either way on genetically modified foods, I don’t think our susceptible infants are the population on which to be testing them. Plus, in a very non-scientific statement, there just seems to be something wrong with “corn syrup solids” being the primary ingredient in formula. Remember, this one food is ALL baby is eating! For some simple math, Enfamil® Gentlease and ProSobee each contain roughly 10g of Corn Syrup Solids per 5 oz. For a 2-month old eating 28 oz per day, this is 56 g of corn syrup solids every day! That is more than the amount of corn syrup in 16 oz. of Coco-Cola. I’ll repeat my mantra here: You must read the list of ingredients! If you don’t read the ingredients, you can’t tell the difference in where the carbohydrates are coming from. Remember that ingredients are always listed in the order of amount. So, if “corn maltodextrin” appears on the list before “lactose”, that means there is more corn maltodextrin than lactose in that formula. I recommend a primarily lactose – based formula. Below is a summary table of the most common mainstream formulas for healthy term babies, and the sources of carbohydrate in these formulas. Thankfully, fat is a little less complicated than the protein and carbs. All formulas will contain a blend of different fats in order to ensure the infant receives a good amount of all of the essential fatty acids (the building blocks of fat). In addition, almost all formulas also contain an additional source of the fatty acids arachidonic acid (ARA) and docohexanoic acid (DHA) even though this is not required by the FDA. These fatty acids are why people go so crazy over fish oil. While not considered essential fatty acids, these fatty acids are found in fairly high (albeit variable!) 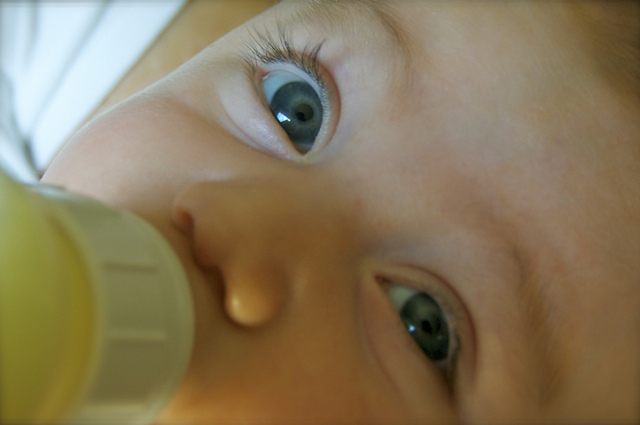 amounts in human milk, and help baby’s brain and eye development. While the research regarding the benefits of ARA and DHA supplementation for healthy term babies is not as strong as the formula companies would have you believe (12), I do recommend formulas with these fatty acids added since they are found in human milk, and there is no detrimental effect to the infant consuming them. Below is a summary table of the most common mainstream formulas for healthy term babies, and the sources of fat in these formulas listed in order of percentage. All of the above formulas also add additional sources of DHA and ARA. That was all the major macronutrients! The remainder of what is in formula is primarily the vitamins and minerals baby needs. You’ll see these listed on the ingredients list after the phrase, “contains less than 2% of”. This is because, compared to the volume of carbs, fat, and protein, the volume of the vitamins and minerals is very small. However, as you may guess, that doesn’t mean they are not important! Since the minimum amounts of 26 of these vitamins and minerals are regulated by the FDA, there is not as much variability to discuss here. Some formulas do add bonus nutrients that aren’t required (lutein is an example). This is great! However, I would prefer you look for a hydrolyzed formula before you start stressing about bonus molecules added at less than 2% of the volume. Understanding the chemical names of the vitamins and minerals given in the list of ingredients can be very confusing! In article 9, I give an example list of ingredients along with a translation of what each ingredient is. This should help you decode your label. Because there is little variation in the vitamins and minerals added to formula, I only want to educate you on one point regarding micronutrients in formula; and this is related to soy formulas. Soy contains large amounts of phytate, which is a molecule that can bind to certain minerals and hold them hostage so that baby’s intestines can’t absorb them. For this reason, soy formulas have to contain more minerals than cow’s milk formulas in order to ensure babies get enough minerals to grow. For example, if you compare Gerber® Good Start Gentle (milk-based formula) with Gerber® Good Start Soy, you will see that the Soy contains more of 10 minerals – this is all minerals except Copper and Selenium. It is for this reason that the American Academy of Pediatrics (AAP) has stated that soy formula should never be the sole source of nutrition for premature infants (13). Because these babies have an even greater need for minerals than healthy term infants, the inhibitors in soy formula can make it impossible for them to absorb enough minerals, jeopardizing their growth. I have not hidden my lack of enthusiasm for soy-based formulas, and this is another major reason. The fat in formula will be a blend, to cover all the essential fatty acids baby needs. There is much less variation in the fat blends used in formulas for healthy term babies. There is also very little variation in the vitamin and mineral content in formula as most of these are regulated by the FDA. Soy formula must contain more of several minerals due to the inhibitory molecules that are in soy. Premature babies should never be fed soy formula, and I do not recommend it for term babies either.